Buddha Purnima also known as Buddha Jayanti is a day when Buddha was born, enlightened and attended Mahaparinirvana. The exact date of Buddha’s birth is based on lunisolar calendar and varies with western Gregorian calendar. However it falls in April or May and in June in leap year. This is the day when Buddha was born 623 BCE in Lumbini garden that falls in modern Nepal. Buddha Purnima is celebrated in most of the East Asian countries as a day of triple bliss. Special prayers and chanting are organized in Buddhist monasteries and monuments during the day. In the evening the monuments are decorated with flowers and lamps and incense are offered. Buddha Purnima is an auspicious time to visit Lumbini and other Buddhist sites of Nepal. The day is celebrated by both Hindus and Buddhists in Nepal and is also a public holiday. There are over ten thousand Buddhist Chaityas in Kathmandu valley only. 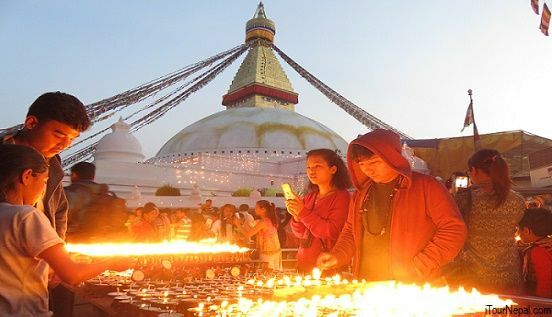 Among them the Swyambhunath and Boudhanath are the most popular and must to visit place for Buddhists. Similarly other important Buddhist sites like Guru Rinpoche cave of Pharping, Namo Buddha Stupa and the Buddhist monastic town of Patan celebrates it with ceremonies and butter lamp offering. Hundreds of people visit these sites throughout the day worshiping Buddha, observing precepts and giving Dana (donation). During the day ceremonies are held to give sermons, display Buddha relic and honor Buddha. Buddha Purnima falls on 18 May 2019 of Gregorian calendar. May is almost the end of Spring tourist season and the beginning of summer. 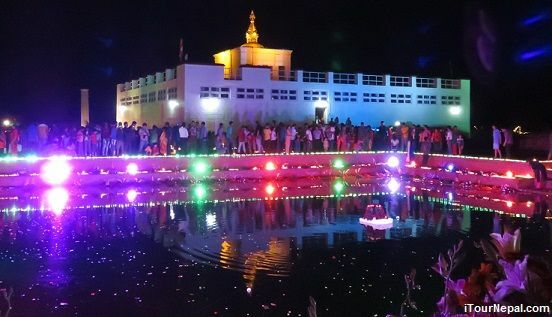 So it is perfect time to visit Lumbini for the Buddha Jayanti 2019. Customize your Lumbini tour with visit of other important Buddhist sites like Kapilavastu palace ruins (Where Buddha spent 29 years as prince Siddhartha) and Kudan (Nigrodharma), the residence provided to Buddha by his father King Suddhodhana on homecoming after his enlightenment. Visit our Lumbnin Buddhist circuit tour. You can also visit other important Buddhist sites in Nepal and be in Lumbini for the Buddha Jayanti celebration. Our 8 days Buddhsit tour of Nepal covers must to visit site within Nepal. Lumbini is one of the four Buddhsit pilgrimage sites referred by Buddha himself. "O-Bhikshus', after my death when people and members of a new generation come and ask you, then tell them that here the Buddha was born, here he attained the full enlightenment, here he turned the wheel of Dharma twelve times, and here finally the Buddha entered into Parinirvana"
The Buddhist scriptures explained Lumbini as heavenly garden between two kingdoms of Kapilavastu and Devdaha. Queen Mayadevi was travelling to her maternal hometown, Devdaha when she went into labor and gave birth to Buddha at the Lumbini garden. 3rd century BCE, Emperor Ashoka erected pillar with inscription to mark the birth place of Buddha. The Stupas and monasteries survived until 7th century which was documented by the Chinese travelers Huian Tsang and Faeihan. However the exact location was lost with time as Buddhism in the area continuously declined subjected to socio-economy, politics and Muslim invasion. The place got attention of the world only after German archaeologist Dr. Alois A rediscovered the broken Ashokan pillar in 1886 AD. With the discovery the place got attention of world Buddhist pilgrims. In 1996, UNESCO declared Lumbini as World Heritage Site. Lumbini has been recreated as the legendary garden in the area of 6 by 2 km. The total area of 72 sq km comprises sacred garden, monastic zone and Lumbini village.